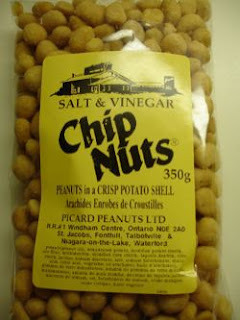 My brother Kyle introduced me to my new favourite food – salt and vinegar chip nuts. It’s a peanut coated in crispy potato-chip stuff, then dusted with salt and vinegar seasoning. It has the goodness of potato chips combined with the positive health benefits of peanuts – what’s not to like? I usually enjoy mine with a side of pork rinds, a litre of egg nog, and deep-fried Mars bars.Oh yeah, the diet officially starts on January 3rd (I need to give myself a couple of extra days to clear out my stash of chip nuts and chocolate).